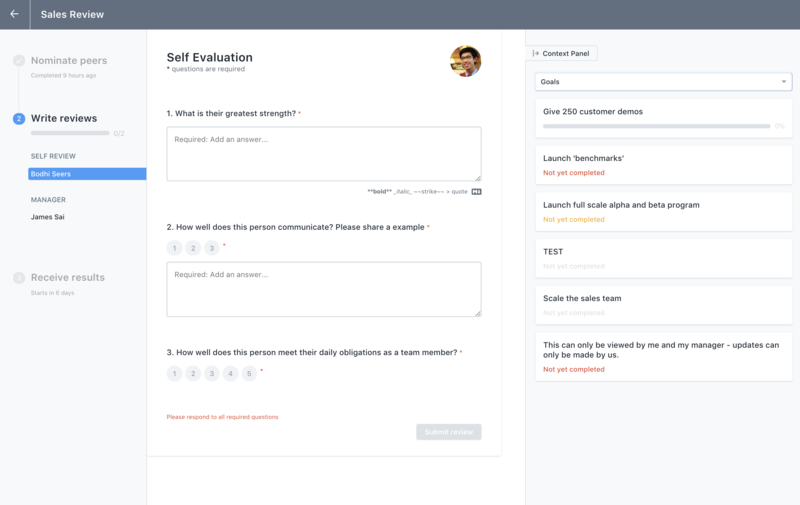 When it comes time to fill out a performance review, Lattice will notify you via email. Once you sign into your account, you'll see a task waiting for you on your "You" page. 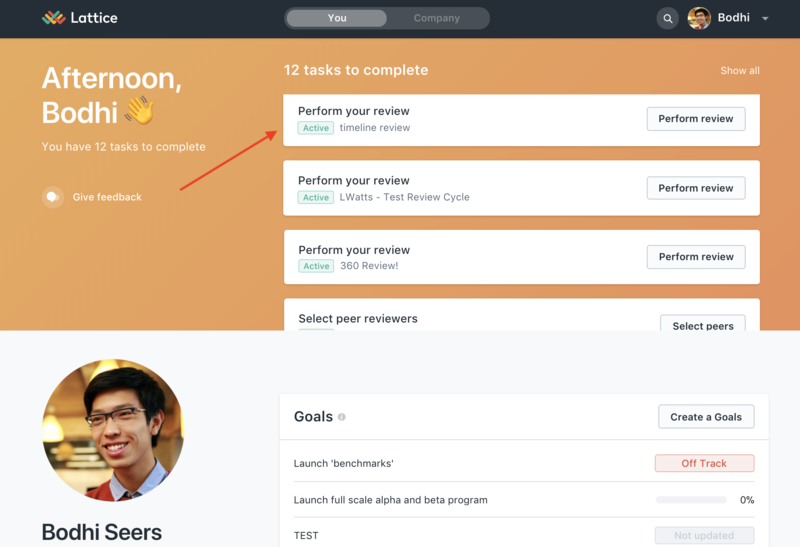 Once you click into the open task, you'll be prompted to begin your review. 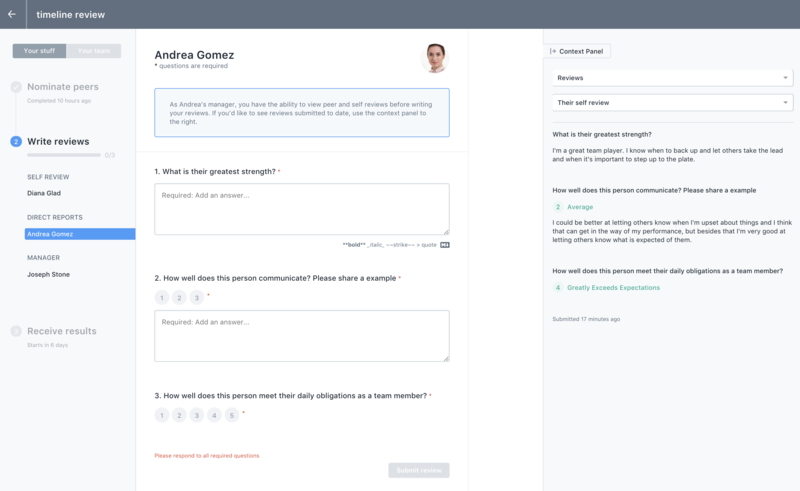 You'll see the title of the "Performance Review" on the top left, a list of people you need to review on the left side, the review questions in the middle, and any Feedback or Goals associated with the person you are reviewing to the right. As you fill out the reviews, your answers will auto save, so no need to worry about exiting out of the review. Click "Submit review" when you're finished writing the review. Submitting your review locks and finalizes it which disables you from going back in and editing it without the help of an admin. If you have more reviews to complete, the next review that needs to be written will show up on screen! 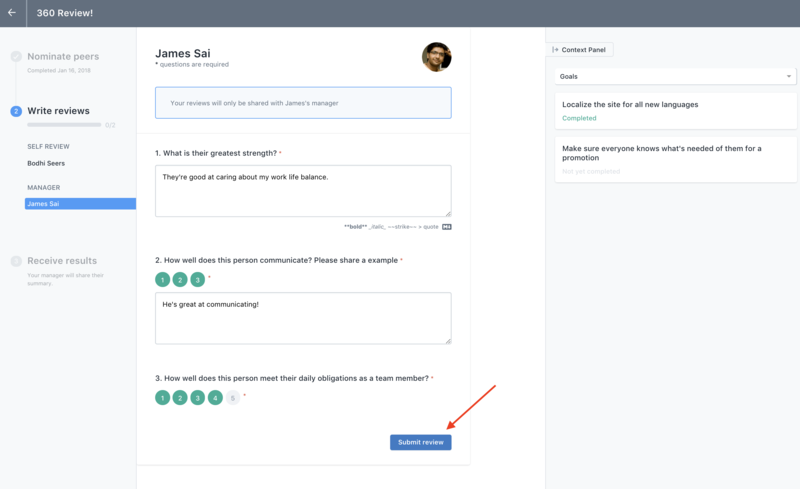 For managers, if your admin allows you to see your reviewees (direct reports) reviews as they fill them out, you'll have a slightly different user interface as you fill out your reviews. Here you see that Diana has access to Andrea Gomez's self review and their peer reviews. Once you've finished your reviews, you're done! Note: If you're reviewing yourself, or someone whose feedback you have access to (like a direct report), you'll see all private and public feedback [depending on visibility settings]. If you're reviewing someone that you only have restricted access to, you'll only see their public feedback. 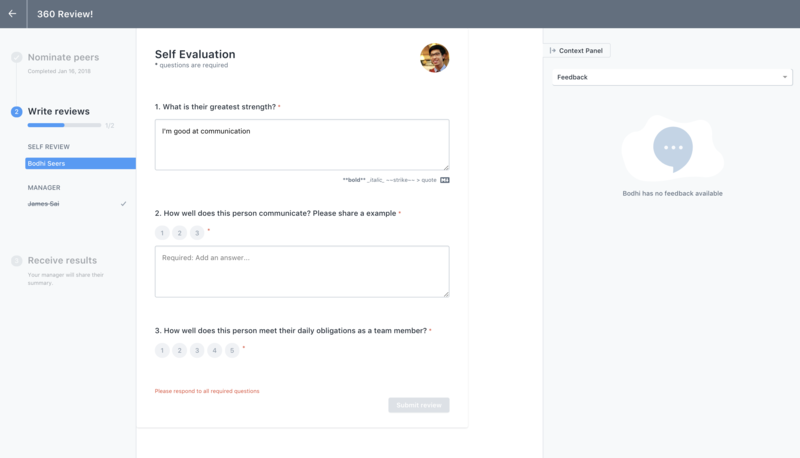 We hope that giving employees the ability to access Goals and Feedback will decrease recency bias and enable everyone to give more unbiased and thorough reviews.